Simple route requests return route information between the two locations. Simple multi-address route requests return route information between three or more locations. The ordering of the locations in the response is user specified and is not optimized. Traveling salesperson (TSP) route requests are a form of multi-address route request and also return route information between three or more locations. The ordering of some or all of the locations in the response can be reordered to optimize the overall route. Batched route requests are a batch of one or more simple or multi-address route requests. This can be a mix of simple, simple multi-address and TSP requests. Each individual request looks like a single request but is encapsulated in a <batch_route_request> element. The routing engine differentiates batched requests from batch mode requests when it finds a <route_request> element embedded in the <batch_route_request> element. Batch mode route requests return multiple responses, each with the same start location but different end locations. For all requests, the start, intermediate, and end locations are identified by addresses, pre-geocoded addresses, or longitude/latitude coordinates. Multi-address routes are explained in Routing. 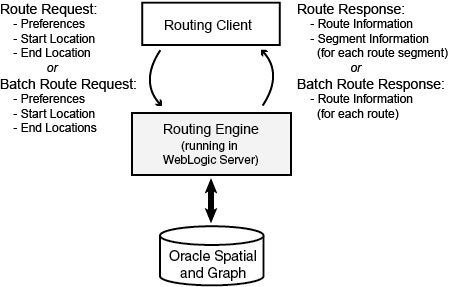 The Oracle Routing engine is implemented as a Java 2 Enterprise Edition (J2EE) Web application that can be deployed in an application server such as Oracle WebLogic Server. Figure 13-1 shows the basic flow of action with the routing engine: a client locates a remote routing engine instance, sends a route request, and processes the route response returned by the routing engine instance. Description of "Figure 13-1 Basic Flow of Action with the Spatial and Graph Routing Engine"
This chapter does not include information about administering the routing engine. That information, which is for advanced users with specialized needs, is in Routing Engine Administration.